Walt, I assume they will take longer to get to the point of fruiting, and be slower to replace any growth lost to cold damage. Perhaps the fruit might be miniaturized. Once mature, they may be fine. I guess I have a preference for strong, vigorous growth. If they are dwarf because they just grow slower, then I can agree, though I repeat that having survived your winter they are worth having and breeding them. But if they are dwarf because their internodes are shorter thyn may not be slow maturing. Good point, Walt. I am obviously not going to discard any of the surviving plants. I'm evaluationg what I assume they could contribute toward the goal of extreme cold hardy citrus. And I agree that their genetics should be valuable, as their progeny likely will carry hardiness when crossed with full sized specimens. Poncirus vegetative buds have just started to swell the least bit and I expect the surviving hybrids to follow suit shortly. That will bring a moment of truth to this venture. Poncirus leaf buds have just started to swell the least bit and I expect the surviving hybrids to follow suit shortly. That will bring a moment of truth to this venture. 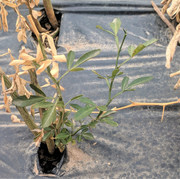 So the hybrids are breaking dormancy later than P. trifoliata. That would be a good trait here, where late spring freezes are common. Unless the hybrids are breaking late due to some cold damage. I am learning a lot from your experiment. Thank you for sharing all this. This is an educational experience. I am impressed by the broad range of characteristics the F2 .progeny are displaying. I don't regret the large population grown. If there is ultimately one hardy seedling per two thousand plants, it should be roughly reproducible on a repeat test under similar conditions. "it should be roughly reproducible on a repeat test under similar conditions." If done in a zone 7 environment there should be even more survivors. I wonder if you can share your experience if any on ~500 N1tri seeds that I sent you last autumn? I will. By now the tallest are around 10 cm high. There are others beside still just germinating. Using US 852 seedlings, with 60-70% zygotic seedlings would be good. I might try to buy Stans whole crop next year. From 14 fruit this year I got only 50 seedlings, If I had sterilized the seeds, I might have had over 288. As Ilya said, this has been a learning experience. Walt, I am becoming suspicious that emerging and newly emerged seedlings exposed to low temperatures can develop leaf yellowing and stunting. I had a batch of TaiTri seedlings that had a late emerging seedling among more mature seedlings. 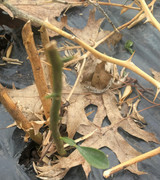 This plant developed yellow leaves, has a green stem, therefore is likely stunted at least temporarily, but not an albino. Albinos will have the same stem and leaf color. This may be related to SoCal's experience of exposing young seedlings to low temperatures and having the seedlings develop yellowing leaves. It is possible to cold -injure immature plants without downright freezing them. I have no concerns with introducing even recently emerged seedlings outdoors if the temperatures are high enough. When the seedlings achieve 3"-3 1/2" in height I've put them outside in the 60's F., providing it's sunny and calm. Where I am (Olympia, WA zone 8a) I've found that it is not really safe to bring citrus seedlings outside (even hardy varieties that have been growing inside) until the second half of March. It is different in different places. Places like Minnesota and Massachusetts can have later Spring frosts. I expect to have to carry my plants inside a few times. Yjey won;'t be safe for another 5 weeks. But they need to get used to the sun gradually. Wind too. Basicly I'll treat them like tomatoes. Some of the F2 seedlings have just begun to push buds today. It's barely noticeable, should become more obvious over the next 3 days as warm weather is in the forecast. I'll attach a photo, the expanding bud is on the upper right side of the stem. Now it becomes a wait and see game to see how many will grow. Photos showing the impact -11.8 deg F. had on Poncirus at this 6b location. Mature growth is fine, immature growth is being sorted out between tip die back and new growth stimulus from the roots. 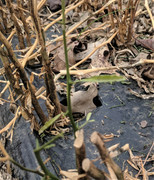 The damaged fall growth demonstrates the result of the sub-zero temperatures suffered at the end of Jan - beginning of Feb. The remainder of the photos are examples of hardy dwarf F2 citranges. I'm favorably impressed by the cold resistance performance of a very few of the F2 population in comparison with Poncirus. Granted, there is a very low percentage, but the concept appears to be valid. Fruit edibility of the hardy specimens is quite another hurdle indeed! After cutting the plants down low to the ground I was able to get a better count on the number of survivors. There should be 12 normal sized survivors, they are not all equals, some lost more stem than others. Counting even the smallest dwarfs, there are about 66 dwarf survivors. Many of these are not very impressive due to low vigor. The flags were used last summer to identify zygotic seedlings, they're no longer of much value. Due to the fact that the dead citrange tops have been cut off, I was able to weed the 4 rows of plants this morning. Ilya had mentioned that some of the plants would regrow from the roots. I had dismissed that possibility as each time I canvassed the plants their condition had declined further. That's no longer the case, as some plants I had dismissed as doomed are growing from a lower stem point. So, I need to categorize the remaining plants into at least 3 categories: normal sized and stem hardy above the snow line, dwarf and hardy (likely under the snow), and normal sized, but only stem hardy under the snow during our sub-zero temperatures. As they grow out, the stem position where the new growth originates will show how stem hardy the plant was. 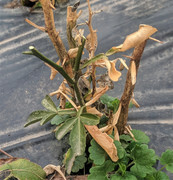 Unless the plants regrowing from low positions are unique in some way (monofoliate, etc.) they might not be included in the elite group of super hardy specimens for further breeding. They do warrant preservation and further evaluation, however. They might be better suited to zone 7 growing conditions. I assume that the F1 hybrids are dead, and the under-snow hardy plants are F2 plants. As soon as your trees have leaves, you might taste them as Ilya does. It would be great if even one lacks the Poncirus taste. Great idea Walt, even a second tier hardiness specimen would be of value if it had improved taste. A few monofoliate dwarf F2 plants. Low vigor, hardy under snow. Today I cross-pollinated my HRS 899 Variety which I got from Bernhard Vosss years ago (letter I don't know) with pollen of Citrus Lemonade, a vareity of New Zealand which tastes like sweet Lemon imonade ;-) I will see what will happen. Usirius, It's impressive how strongly the phenotype in the flowering branches resemble Poncirus! How hardy have you experienced it to be? Are you sure that it is not a poncirus rootstock that took over the HRS graft? As I remember all HRS899 seedlings of B.Voss are evergreen. Usirius I couldn't remember if Poncirus flowers had a flower stalk. Since mine are in full bloom at present, I took a look at them and was surprised to see them vary from almost no stalk to a short stalk. The flowers with a stalk had fuzzy hairs on the stalks (pubescense). If your tree is a hybrid indeed, it appears to have retained many Poncirus characteristics. This should prove helpful in achieving winter hardiness. My cellphone doesn't take very good macro shots, or I'd attach several.